Early Sunday morning in downtown Reno, a crowd of neon-clad runners gathered on the north side of the Reno Arch and proceeded down Virginia Street in waves. An occasional late-night casino patron stumbled out of the Eldorado and into the commotion of Reno 5000’s Downtown River Run, blinking in the bright sunlight. At 7am, a group of marathoners, just over 100 in all, headed up the Truckee River trail toward Verdi. An hour later, the half-marathon runners took off (more than 400 runners), followed by the 10k (358 runners), a 5k (323 runners) and a junior 1-mile fun-run (28 runners). All together, that was a lot of healthy people hitting the streets on a Sunday morning. Congrats, Reno! Runners in the Downtown River Run, Sunday April 12, 2015. Notes and observations: Moving quickly along the riverbanks. Couldn’t see what they were running from. There is a reason that cities in the Great Basin are located next to water bodies, and it isn’t just because they’re nice to jog next to. That’s a great benefit though, isn’t it? It’s important to preserve the river for wildlife, and for our own water needs, but also because it makes Reno such a nice place to live. If you’d like to go running (or walking, or biking) near the Truckee, the Tahoe-Pyramid Bikeway now connects much of the way from Lake Tahoe to Pyramid Lake. For more info and trail maps, check the Tahoe-Pyramid Bikeway’s website. Or, start training for next year’s Downtown River Run; rumor has it that next year’s marathon prize purse will be bumped from $1000 to $2000. It is now a Boston Marathon Qualifying event. A crowd gathers in downtown Reno on Sunday morning for the Reno 5000’s Downtown River Run. April 12, 2015. 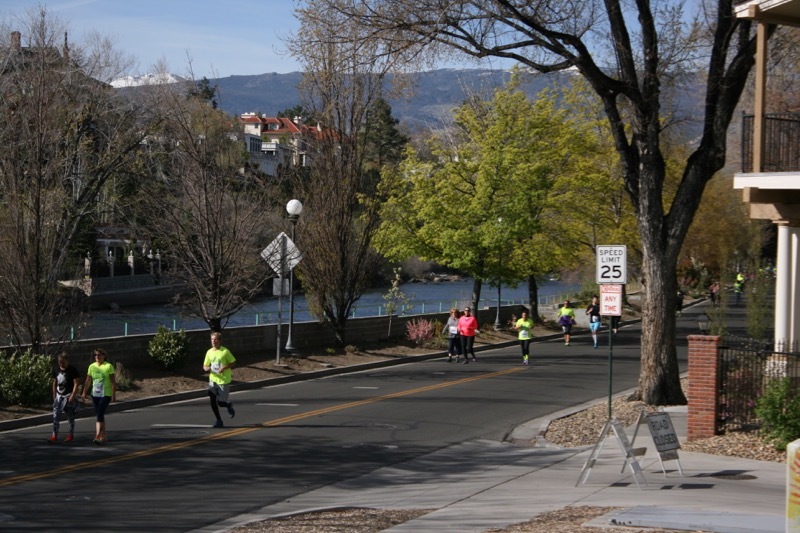 The race course for the Downtown River Run followed the Truckee River toward Verdi. April 12, 2015. Sunday’s Downtown River Run started and finished under the Reno Arch. April 12, 2015. I hadn’t noticed that one missing from the species list! It’s a mammal, right? Yes, they become very common down by the river this time of year! Sounded like great fun. Good observation!